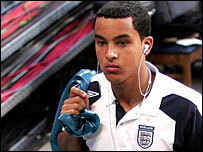 Sven-Goran Eriksson has defended his controversial decision to take Arsenal teenager Theo Walcott to the World Cup. Walcott, 17, made England's squad despite Eriksson never seeing him play, and he did not feature as they went out to Portugal in the last eight. Eriksson said: "I am sure I took the right players, and not for my benefit. "It will have served Walcott extremely well for the future. He has been to a World Cup, knows how it is and it will be very good for him in his career." And Eriksson, whose reign as England coach ended with the Portugal defeat, brushed aside suggestions that Spurs striker Jermain Defoe would have been a better option. "I don't think so. If I had thought so I would have picked him," he said. "I've seen him 15 or 20 times this season and I have to take the best players who I think will be good for us in the future." Eriksson also backed Steve McClaren to be a success as England coach as he prepares to succeed the Swede. He said: "He's very good. I have been working with him for five and a half years. "I'm very happy for him and I think it's the right decision for the Football Association to take him on board. "He's been doing very well for Middlesbrough, especially this season, taking them to the Uefa Cup Final. And he's been on the bench in the England squad for a long time. "He's a very good coach, excellent coach. He gets on very well with the players. "He's open-minded, he wants to learn. He will be a very good manager for England." Asked if McClaren must take his share of the blame for England's disappointing World Cup performance he said: "No, don't blame him. Blame me, please."